Location: Marmanhac, in the Cantal departement of France (Auvergne Region). Ownership / Access: Owned now by the Riverieux Family of Varax. Open for visits and its now a Bed and Breakfast place. Notes: Château de Sedaiges (pronounced Sédage) is a medieval castle and Gothic Revival located in the Cantal Marmanhac. It is listed as a historic monument since September 24, 1987 and has a remarkable park with orchard, vegetable garden and rooms of water 2. 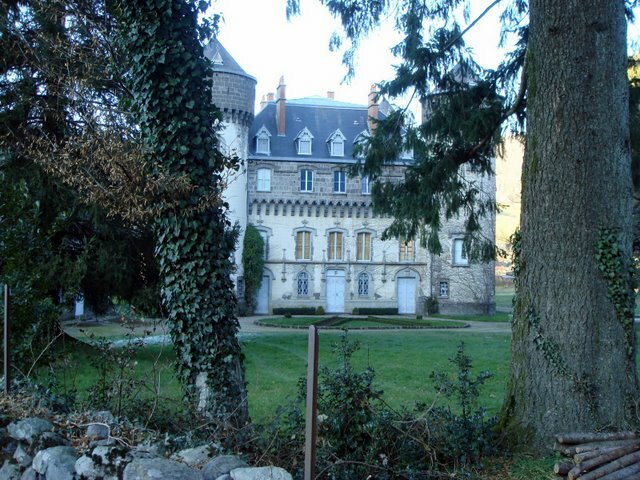 This house is transmitted in different families descendant of Jean Caissac who bought it in 1442. three-storey square building flanked by four round towers. Rebuilt into a fortress from 1452 and embellished in the eighteenth century, this impressive castle offers also a unique example of architecture of the nineteenth century troubadour. In 1741, the castle was brought up to date by expanding openings and adding wood paneling in some rooms. Around 1865, the architect Parent performs important work on the building. The general plan of the castle was respected in his appearance. The building was dressed in neo-Gothic style. Windows and doors were framed with a neo-15th decor. A walkway was added to the four corner towers, in imitation of the one kept on the south facade. The central courtyard was covered and converted into hall. The woodwork and paint elements are treated in the style of late Gothic period.